As a movie fan, I love it when a filmmaker and an actor build a collaborative relationship that endures over several movies. The history of film has seen so many incredible partnerships over the years along these lines. I’m thinking of John Ford-John Wayne, Martin Scorsese-Robert De Niro, Josef von Sternberg-Marlene Dietrich, and John Huston-Humphrey Bogart. These relationships led to some of the best movies I’ve ever seen but every once in a while a team comes along where the relationship is almost more interesting than the movies resulting from their creative partnership. The most temperamental of these relationships that I know is that of director Werner Herzog and actor Klaus Kinski. For decades Werner Herzog has been building one of the most fascinating bodies of work in film history. He is the type of filmmaker who when he hears that a volcano is about to erupt or that a Middle Eastern dictator is setting oil wells on fire, he grabs a film crew and heads straight into the heart of darkness to make a movie (see “La Soufriere” (1977) & “Lessons of Darkness” (1992)). Herzog’s documentaries such as “Cave of Forgotten Dreams” (2010) and Grizzly Man (2005) have helped a new generation of film fans recently to discover his work but back in the 1970s and 1980s Herzog and Kinski took their filmmaking and their sanity to the absolute limits of human endurance shooting unforgettable movies in some of the most inhospitable environments on the planet. Before Herzog and Kinski began working together Herzog was already building a reputation as one of the most radical and fearless filmmakers alive. “Even Dwarfs Started Small” (1970) and “Fata Morgana” (1971) would be enough for Herzog to have a page in the history books, but one gets the sense that in Klaus Kinski he finally found the perfect madman that allowed Herzog to take his narrative filmmaking to new heights. Conversely, Kinski made perhaps more movies than any other actor who’s ever lived but it wasn’t until he began working with Herzog that Kinski truly showed us what he was capable of as an artist. In Herzog’s documentary “My Best Fiend” (1999) Herzog shares some hysterical anecdotes about his first encounters with Kinski when they were living in the same boarding house long before they ever worked together. A man of extreme passions and wild mood swings, Kinski was the complete opposite to Herzog’s detached intellectual persona. No two people could be less compatible on a personal level but on an artistic level the two men complemented one another perfectly, offering different dimensions and insights that the other lacked. It seems that it was inevitable that fate would eventually bring them back together and when it did, they changed German cinema forever. The film that started it all, “Aguirre, the Wrath of God”, is one of those movies that makes me feel like I am going insane while watching it. The film follows a failed 16th century expedition by conquistadors in search for El Dorado. Disaster besets the team every step of the way allowing Don Lope de Aguirre to seize control over the expedition. By the time the film reaches its finale, audiences are left so tormented that having a conversation with monkeys will seem like the most logical thing to do. This was also the film where Herzog began building his reputation of shooting his films in incredibly remote, physically taxing locations. This movie is worth watching for the opening credit sequence alone (see below). Adapted from the play of the same name by Georg Büchner, the character of Woyzeck is the complete opposite of Aguirre. He’s weak, tormented, a cuckold and with this role Kinski gave the performance of a lifetime. Watching the slow boil of his emotions build to their inevitable violent crescendo is fascinating to watch. Werner Herzog has gone on record that he believes F.W. 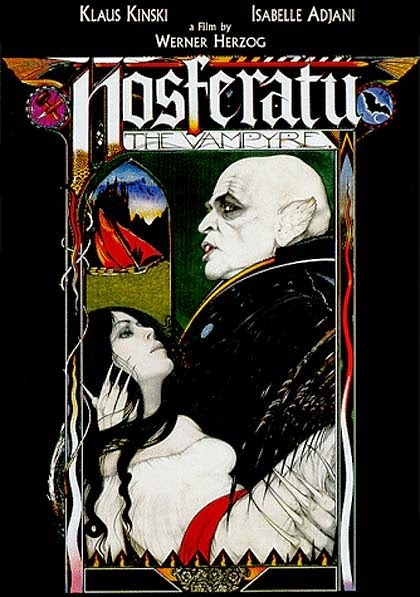 Murnau’s “Nosferatu” (1922) to be the greatest film ever to come out of Germany. It is hard to argue with that assertion, however, Herzog’s remake of that horror classic is an unbelievably cool movie that every horror fan should see. Isabelle Adjani might be the most beautiful woman ever to appear on film and her relationship with Kinski’s Count Dracula ranks up there among the great tragic romances of the horror genre. No film has been discussed more in Herzog’s career than “Fitzcarraldo”. The history of film has many fascinating stories about disastrous productions beset by nearly insurmountable problems, but very few can compare to “Fitzcarraldo”. The problems faced by this film are so legendary that they often overshadow the story of the film itself about a rubber baron who wants to bring opera to the Amazon jungle. Part of his mad scheme involves dragging a boat over a small mountain to create a shortcut for his rubber business, a feat of strength that perfectly mirrors the horrors Herzog faced while shooting this movie. Thanks to the tireless efforts of documentary filmmaker Les Blank, we have the movie “Burden of Dreams” (1982) which follows this production from start to finish and it is awe inspiring to watch. The two films together make the perfect double feature about the costs that come with pursuing one’s vision and the ambition required to make that vision a reality. I have to confess that I have only seen this movie once, fifteen years ago, and my memory of the movie is pretty dim. Kinski plays a bandit working on a plantation but after impregnating the daughters of the plantation owner, he is sent to Africa to negotiate the purchase of more slaves. Gradually he goes completely insane (even by Kinski’s standards). I’ll have to revisit this movie but if memory serves correctly, this was not the best collaboration between Kinski and Herzog. That said, even if the movie is a retread of familiar territory, the film is still well worth watching. Klaus Kinski sadly passed away in 1991 putting an end to this incredible filmmaking partnership but a few years later Herzog made this touching documentary about their love/hate relationship. For fans of their work, the documentary is absolutely required viewing. The movie is unintentionally hysterical due to the long list of insane stories shared by Herzog about Kinski’s unpredictable behavior over the years, the best being when Herzog threatened to have Kinski shot on sight when he tried to abandon the production of “Aguirre, the Wrath of God”. For those of you who enjoy Werner Herzog’s work, the good news is that he has been steadily making movies since the 1960s. Some of the other Herzog films that I love are: “The Flying Doctors of East Africa” (1970), “The Great Ecstasy of Woodcarver Steiner” (1974), “The Enigma of Kaspar Hauser” (1974), “How Much Wood Would a Woodchuck Chuck…” (1976), “Little Dieter Needs to Fly” (1997). My study of Herzog is still a work in progress with at least a dozen more films by him that I want to see. Give me a shout and let me know what your personal favorites are.